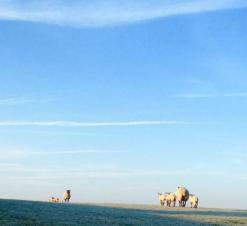 Local farmers can also join Rural Watch details of which can be found by following the above link. With its rural setting Shearsby is deserving of a calendar which celebrates all things flora and fauna, farming life, lovely gardens and scenic views. 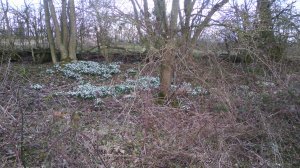 For a full set of photos go to the gallery and in the dropdown box select Countryfile and Go, or click on C.
A snowy day in Shearsby, January 2013. Photos by Richard Kew. 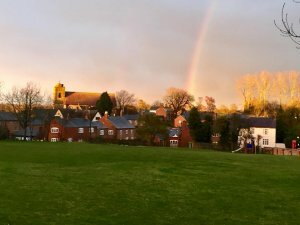 Sunset and a Rainbow over Shearsby on Valentine's Day 2018. 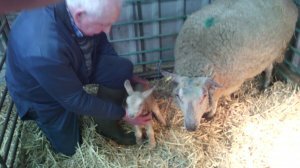 The first lamb of the season, born in Shearsby on 6th February 2018 at 10am, was a ewe. Seen here with David Durran. Litter pickers, we thank you, great job. Over 70 black bags of rubbish collected from the outer environs of Shearsby this morning by the biggest turnout of villagers, so much so that we ran out of kit and bin bags. A recent tidy up around the village saw over 60 bin liners filled plus various tyres, cannabis growing equipment, council kit (including 4 traffic cones), and various bits of cars and vans. Early morning view of lambs in the field on 23rd March 2018. 26/4/18, The first reported swallow, seen over Barnacle's farm land. A Red Kite has been spotted in Welford Road on 2 separate occasions by 2 people. Follow the link to the RSPB site for information. June 2017. A white fox has been seen numerous times around the village. July 2017. Go to the Gallery for the photo. 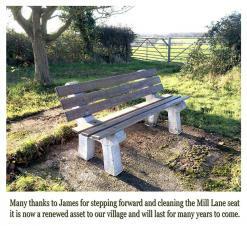 The bench on Mill Lane, cleaned by James Peake, November 2017. Thanks James. 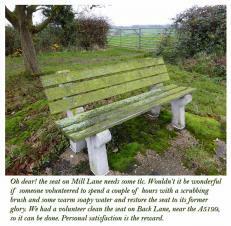 The bench on Mill Lane was in desperate need of a good cleaning, November 2017.